Wayne Taylor Racing proved its strength and endurance to win the rain-plagued 2019 Rolex 24 at Daytona. Drivers Fernando Alonso, Kamui Kobayashi, Jordan Taylor, and Renger van der Zande withstood the adverse conditions and outlasted their Prototype class counterparts on their way to standing atop the podium on Sunday afternoon. Mazda Team Joest started on pole with its No. 77 Mazda RT24-P DPi and was immediately pitted against the No. 7 Acura Team Penske car as they lined up together on the front row. Early hours of the race saw the two manufacturers swapping positions while simultaneously battling off the charging Cadillacs. LMP2 ran close with the four global spec Oreca 07 Gibsons lined up at the beginning. With identical equipment, the class would be a story of strategy and driver performance. Forced to deal with the heavy traffic created by the other classes, all of the entries spread out and battled with other prototypes as well as GT cars rather early. Slightly further back in the field, Porsche led GT Le Mans from the initial green flag. Yet again, the nine-car class was competitive with each team spending their share of time in P1. Risi Competizione, the expected backmarker crew without major factory support, mixed it up with its No. 62 Ferrari 488 GTE from the beginning and into the night. Each team swapped rivals periodically as Ford Chip Ganassi and Corvette also showed their endurance expertise early on. Lap times were rapid in the first handful of hours with drivers fresh and conditions exceptional. The top Prototype entries laid down consistent one-minute, 35-second times and showed extreme speed dipping into the 1:34s. Each of the top four overall finishers completed at least one lap in that range, the No. 31 Whelen Engineering Cadillac DPi V.R setting a fastest time of the race at 1:34.504—within a second of the pole time and track record. Before midnight, attrition had already begun. Mazda Team Joest's race abruptly turned nightmarish when its No. 55 DPi headed to the garage for repairs and the pole-winning No. 77 was forced to retire. The latter dropped out of contention for the lead and relinquished its fighting spirit to the outfit's remaining entry, though an eventual decision to pull the plug after lost time repairing the car resulted in a double retirement. Fernando Alonso displayed his versatility in the No. 10 Wayne Taylor Racing Cadillac by putting his team in the lead and building a significant gap to second place. The two-time Formula 1 world champion became the story of the night while Cadillac ran 1-2 into the 13th hour. 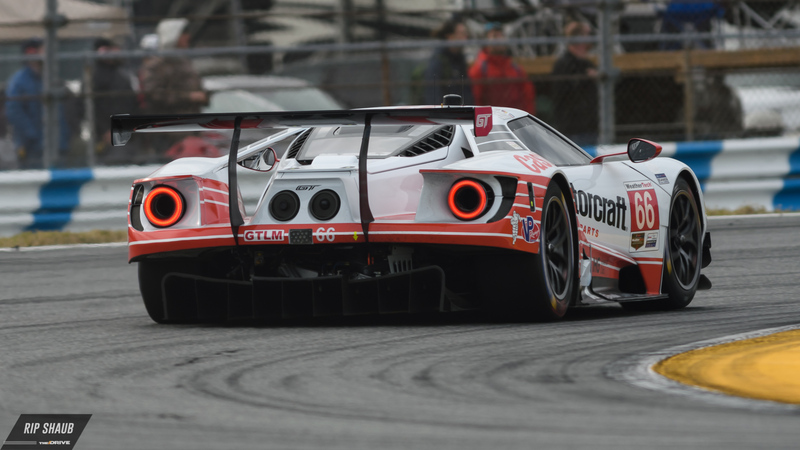 GTLM leader Antonio Garcia dramatically ran his No. 4 Corvette C7.R out of fuel on the way to pit lane, forcing the eighth caution period of the race near its halfway point. It was then that Risi Competizione and BMW Team RLL started to establish themselves at the top of GT Le Mans, though the state of the race changed completely in the following hours. 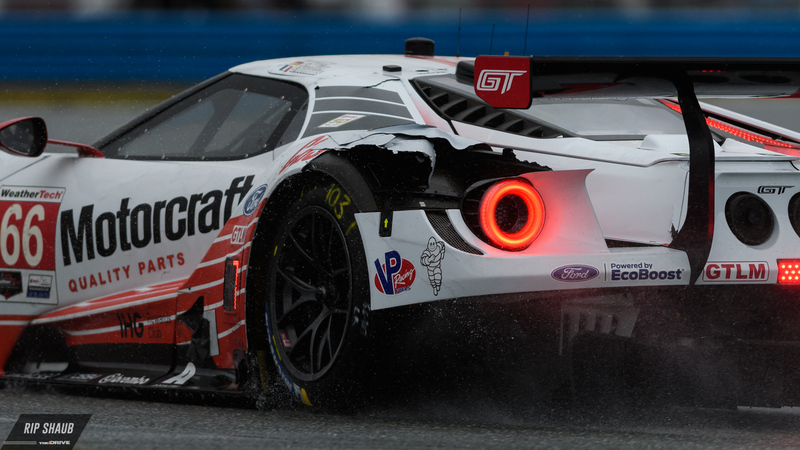 Not to be overshadowed, GT Daytona was also putting on a performance that has become expected of the competitive pro-am category. The No. 33 Mercedes-AMG GT3 of Riley Motorsports had, at that point, fended off the No. 63 Ferrari of Scuderia Corsa to stay atop the largest class on the grid. Jumping forward to 5 a.m. Sunday, rain stole the show away from the close action we had seen in both the daylight and the dark. Standing water accumulated over the next two hours and teams began to sweat. Intense moments on-track and on the pit wall were evident as drivers began to tire, this coming after racing for nearly 18 hours. It was at approximately 7:30 a.m. that IMSA decided to call for the red flag and cars were parked on pit lane for the foreseeable future. This delay held strong while the clock continued to tick, running over two hours off the total scheduled time of 24. Race officials evaluated the situation and decided to call for a restart with nearly five hours remaining. This was promptly met with yet another caution period as an accident involving the Ebimotors No. 46 Lamborghini Huracan and No. 9 Pfaff Motorsports Porsche 911 GT3 R resulted in major wreckage. Flip-flops of green and yellow flags persisted for the next 180 minutes with hundreds of thousands of dollars in machinery crashing into the walls, tires, and each other. Class leaders fell and formerly contending teams, such as Acura Team Penske, fell back due to near-impossible track conditions. Shortly after Alonso recaptured the overall lead from Felipe Nasr in the No. 31 Cadillac, a second red flag was waved—a first in the Rolex's 57-year history. Deliberation by teams and officials was the topic of conversation for the final two hours. The rain refused to let up and streams ran across low-points on the track. 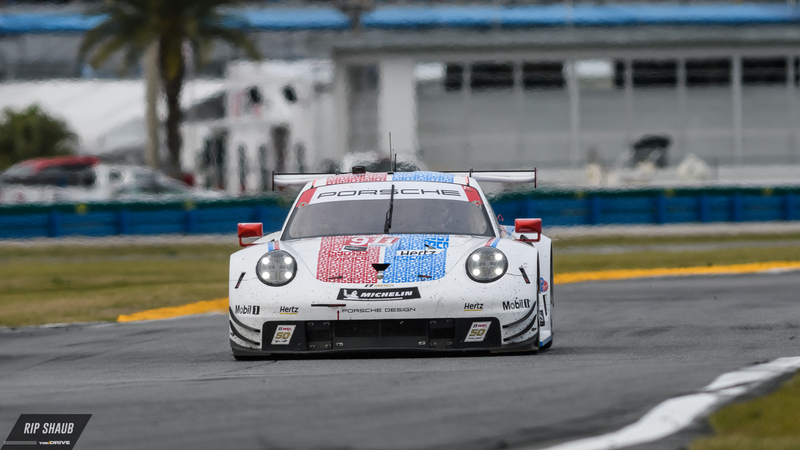 With 10 minutes remaining on the race clock, IMSA made the decision to wave the checkered flag and put an end to the treacherous race. Conclusively, Wayne Taylor Racing claimed overall victory—it's second in three years at the day-long classic. It's also Fernando Alonso's second win in a 24-hour race in the past seven months, adding another notch to his belt that also boasts world-class victories at events like the Monaco Grand Prix and Le Mans. "Just an amazing experience with the team from the test now to the race," Alonso explained in Victory Lane. "A perfect execution of the race. Very different conditions for all the competitors from int he dry, wet, night, so really happy for the team." "It's too bad we didn't get to race the full distance, but we led the race in the night, day dry, wet so I think we all kind of deserve this one," the Spaniard continued. "This was a wonderful opportunity for me to race with this team, and this amazing group of people. They won this race two years ago, and the same kind of car won last year, so this is definitely a good place for this kind of car—the Cadillac DPi. It was a very difficult race. The conditions were quite a shock sometimes." "You had to survive every lap. It wasn't a matter of lap times or anything like that. It was a matter of crossing the light, putting the lap together, and at the end, it worked," Alonso concluded. 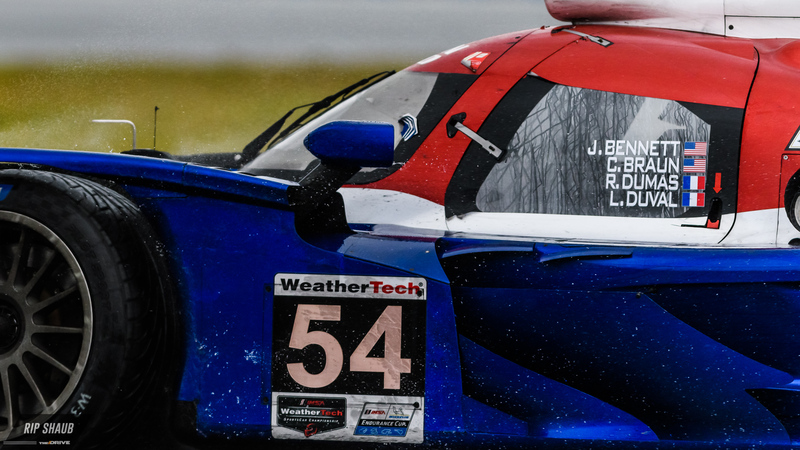 In LMP2, DragonSpeed topped the four-car category, its first ever class victory at Daytona. BMW Team RLL was leading GTLM when the cars parked, making its No. 25 BMW M8 GTE the class winner. This is a continuation of the team's winning ways that saw them manage two consecutive victories late in 2018 while also setting the precedent going forward this season. Grasser Racing Team won the GTD class for the second year running, closely followed by the No. 29 Audi R8 LMS GT3 of Montaplast by Land Motorsport.